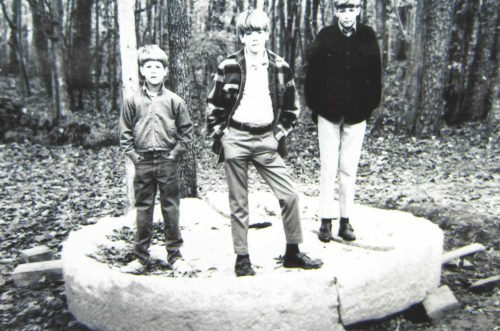 Pictured here are young brothers David, Chip, & Fred Blackley, standing atop a “Chilean” millstone, used for crushing gold ore, at their childhood home on Sardis Rd North. The stone came from the Rea Gold Mine, which was located on 1000 acres around the current intersection of Monroe Rd and Sardis Rd North in Charlotte. When David was a child, there was a deep mineshaft where the current movie theater is at that intersection. This area was originally part of Matthews, and the Renfrow family moved here in 1880 so that Thomas Jefferson Renfrow (Frank’s grandfather) could captain, or oversee, the gold mine. The nickname “Captain” stuck even after the mine closed. “Captain” Renfrow started what was then called “Renfrow General Merchandise & Cotton Brokerage & Ginning” a couple decades later. The mine eventually closed because there was not current pumping technology to keep the mine from flooding.